인도의 한 언론 매체가 제주 해녀를 탐사했다. <인디아투데이>지는 뉴욕에서 사진 작가로 활동하는 김미주 작가의 해녀 사진을 통해 해녀의 삶과 역사를 소개한다. 예로부터 해녀는 제주의 상징으로 자리매김했고, 현대에 들어서도 해녀는 제주 지역경제의 핵심이었다. 그러나 해녀는 점차 고령화 되가는 추세다. <인디아투데이>도 현재 해녀 수자는 4,500명 미만이며 전부 50세 이상이라고 적고 있다. <인디아투데이>의 보도에서는 한때 한국의 ‘인어’로 불린 해녀가 사라져가는 현실에 대한 안타까움 마저 느껴진다. 김미주 작가의 사진은 이 같은 안타까움을 더한다. 김 작가의 사진 속 해녀들은 하나 같이 깊은 주름이 패인 노년의 여성들이다. 고령화 추세에 해녀도 명맥이 희미해져감을 간접적으로 드러낸다. 다음은 뉴스프로가 번역한 인디아투데이의 기사 전문이다. 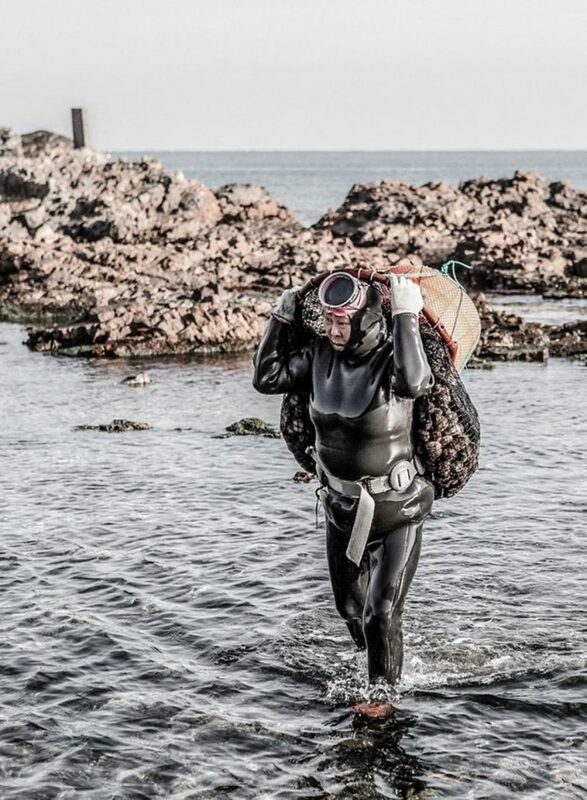 For centuries, mermaids of Korea, Haenyo or ‘sea women’ from the Korean island province of Jeju have been diving into the chilly ocean waters to make their living by harvesting abalone, conch, and octopus. 수세기 동안, 한국의 인어, 즉 ‘바다 여인’이라 불리는 해녀들은 한국의 섬 제주도의 차가운 바닷물에 뛰어들어 전복, 조개, 문어 등을 잡아 생계를 유지해 왔다. Ever seen a mermaid in real life? Visit South Korea before the last generation ceases to exist. 실제로 인어를 본 적이 있는가? 마지막 세대가 끝나기 전에 한국을 방문하시라. 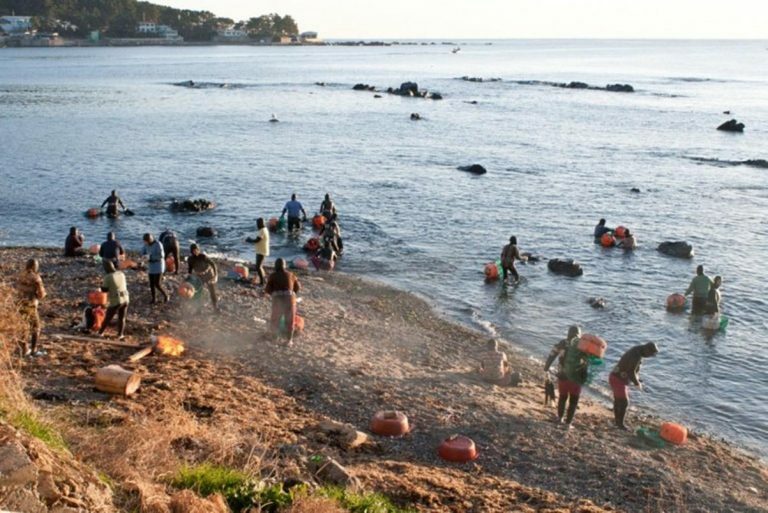 For centuries, mermaids of Korea, haenyo or ‘sea women’ from the Korean island province of Jeju have been diving into the chilly ocean waters in order to make their living by harvesting abalone, conch, and octopus. Now comes the interesting part. 흥미로운 부분은 바로 이렇다. All modern diving equipment are available nowadays so it’s not really a difficult task but haenyo never used any breathing equipment in their life. 요즘은 모든 현대식 다이빙 장비들이 있어 그다지 어려운 작업이 아니지만 해녀들은 평생 어떠한 호흡장비도 사용해 본 적이 없었다. They used to descend up to twenty meters in freezing cold water without any equipment, holding their breath for over two minutes at a time. 그들은 얼음같이 차가운 물 속에서 어떤 장비도 없이 해저 20미터 아래까지 내려가곤 했으며, 한 번에 2분 이상 숨을 참는다. 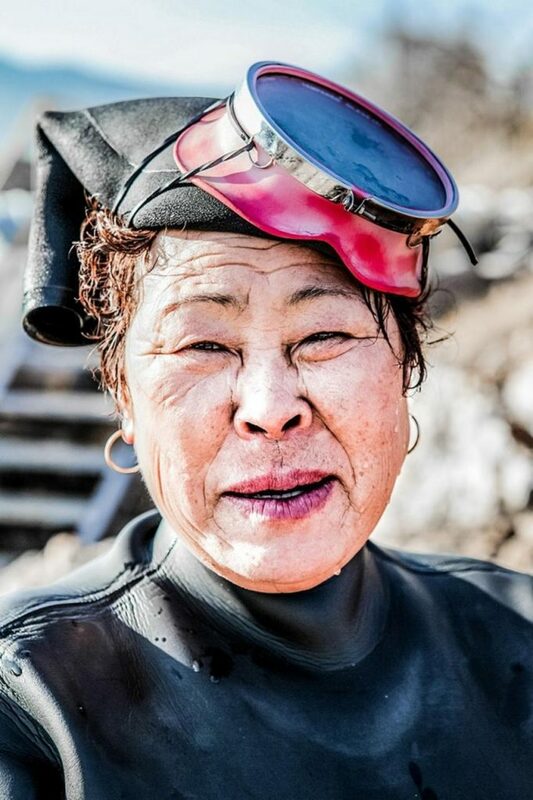 1.They are known as the sea women of Jeju and wear old-fashioned headlight-shaped scuba masks, with lead weights strapped to their waists, so they can sink faster. 그들은 제주의 바다 여인으로 알려져 있으며 헤드라이트 형태의 구식 스쿠버 마스크를 착용하고 더 빨리 잠수할 수 있도록 허리춤에 납을 매단다. 2. Also known as Korean Mermaids, haenyo are able to dive up to 65 feet (20 meters) under the sea, holding their breath for as long as two minutes at a time. 한국의 인어라고도 알려진 해녀들은 해저 최대 65피트 (20미터) 까지 잠수할 수 있으며 한 번에 2분까지 숨을 참을 수 있다. 해녀들의 거의 100 %가 50세 이상이다. 3. Although these women divers were very independent, they were often forbidden to travel outside their villages or reveal their skin. 이 여성 다이버들은 매우 독립적이지만, 종종 자신들이 사는 마을 바깥으로 나가거나 피부를 드러내는 것이 금지되었다. 4. There were over 26,000 haenyo in the 1960s and now there are less than 4,500. 1960년대에는 26,000 명이 넘는 해녀들이 있었으며 현재는 그 수가 4,500 명 미만이다. 5. Almost 100 per cent of these mermaids are over the age of 50. 이 해녀들의 거의 100%가 50 세 이상이다. How do these mermaids search for their food? 해녀들은 어떻게 자신들의 양식을 찾는가? 해녀들은 아래에 그물이 달린, 물 표면에 떠 있는 부유 도구 ‘태왁’ 밑에 수확물을 저장한다. Many of them use various tools to dig conch and abalone from the crevices on the sea floor. Conch and abalone are shellfishes which can be eaten. 많은 해녀들은 해저 틈새의 소라와 전복을 캐기 위해 다양한 도구를 사용한다. 소라와 전복은 식용 조개류이다. The mermaids store their harvest beneath the ‘tewak,’ which is a flotation device left on the surface of the water with a net hanging beneath it. 해녀들은 아래에 그물이 달린, 물 표면에 떠 있는 부유 도구인 ‘태왁’ 밑에 자신들이 채취한 수확물을 저장한다. The Korean tradition of deep-sea diving for oysters, sea cucumbers, abalones, sea urchins, and squid dates back to the fifth century. 굴, 해삼, 전복, 성게, 오징어를 잡기 위해 깊은 바다 속으로 잠수하는 한국의 전통은 5세기까지 거슬러올라간다. 18세기경까지 여성 잠수부들의 수가 남성보다 훨씬 많았으며 따라서 가족의 주된 생계를 책임지게 되었다. Diving was originally considered a male profession, but this changed in the 17th century and by the 18th century, female divers largely outnumbered the males and thus became primary breadwinners of their families. 원래 잠수는 남성의 직업으로 여겨졌으나, 17세기에 바뀌어 18세기에 이르러서는 여성 잠수부의 수가 남성을 능가했고, 따라서 가족의 주된 생계를 책임지게 되었다. 왕이 한국을 다스리던 시절, 이 사람들이 거둔 수확의 대부분은 왕에게 공물로 주어졌다. 그러나 일본이 한국을 점령했을 때, 이것은 바뀌었다. 그러한 관행은 없어졌고 해녀들은 자신들이 수확한 것을 자유롭게 시장에 내다 팔았다. 시간이 흐르면서 잠수는 해녀에게 수익성이 높은 직업이 되었다. 그들 중 상당수는 일본 상인에 의해 고용되어 일본에서 임금 노동자로 일하기도 했다. 1945년 2차 세계대전의 결말로 일본의 한국 통치가 종식되었으나 여성 잠수부들은 계속 제주 경제의 핵심 부분으로 남았다. 여자들이 가족의 경제적 복지를 책임진 반면, 남자들이 가정을 보살피고, 아이들을 돌보고 요리를 했다. 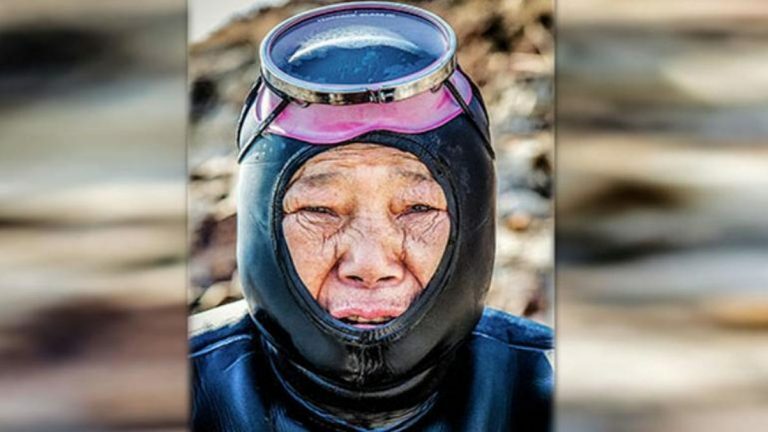 For years, Korean mermaids wore homemade cotton suits while diving in the freezing waters of the ocean. 오랫동안 한국 해녀들은 차가운 바다에서 잠수하는 동안 집에서 손수 만든 면으로 된 작업복을 입었다. The 1970s became a turning point for them as wetsuits became available in the marketplace. 고무로 된 잠수복을 구입할 수 있게 되며 1970년대는 이들에게 전환점이 되었다. 고무로 된 잠수복은 해녀들이 더 깊이 잠수하고 물속에 더 오래 머물 수 있게 함으로써 해녀들의 수입은 늘게 되었다. However, this led to the decline in income as spending time underwater bought many risks and health problems for haenyo and women slowly abandoned the sea-diving industry. 하지만, 물 속에서 많은 시간을 보내는 것이 해녀들에게 그만큼 많은 위험과 건강문제를 안겨줘 여성들이 서서히 바다 잠수일을 포기하면서 수입의 감소로 이어졌다. 해녀의 전통이 여전히 남아 있기는 하나 오래가지는 않을 것이다. 뉴욕에서 활동하는 사진작가 김미주 씨는 이 강인한 여성들을에 대해 기록하기로 결심했다고 말했다. “They are the last generation of Haenyo,” Kim told the Huffington Post. 김 씨는 허핑턴포스트에 “그들이 해녀 세대의 마지막”이라고 전했다.